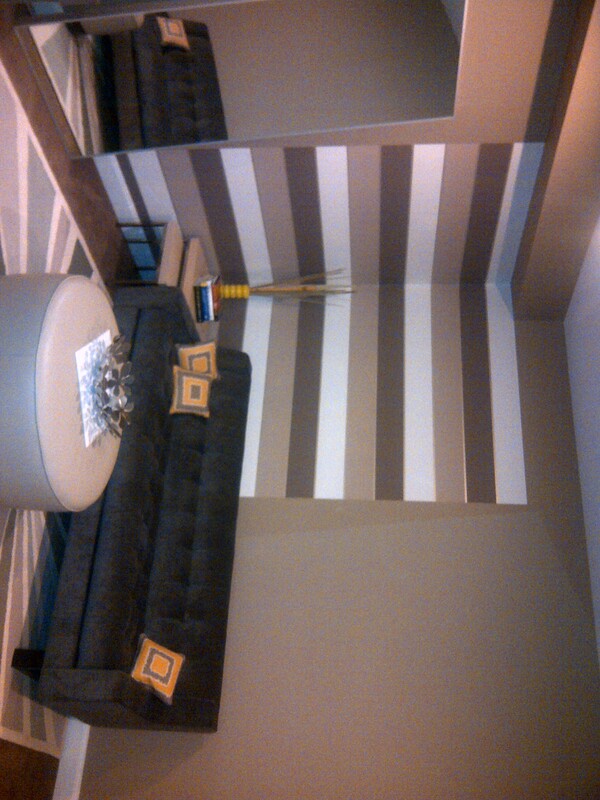 Here’s an interesting wallpaper treatment I did with stripes in a bedroom in the Lake Olympia (Sugarland) area. Wide stripes were hung horizontally, on adjoining walls, for just a few feet. The intent was to define a corner of the room as a reading nook. I think it turned out great. 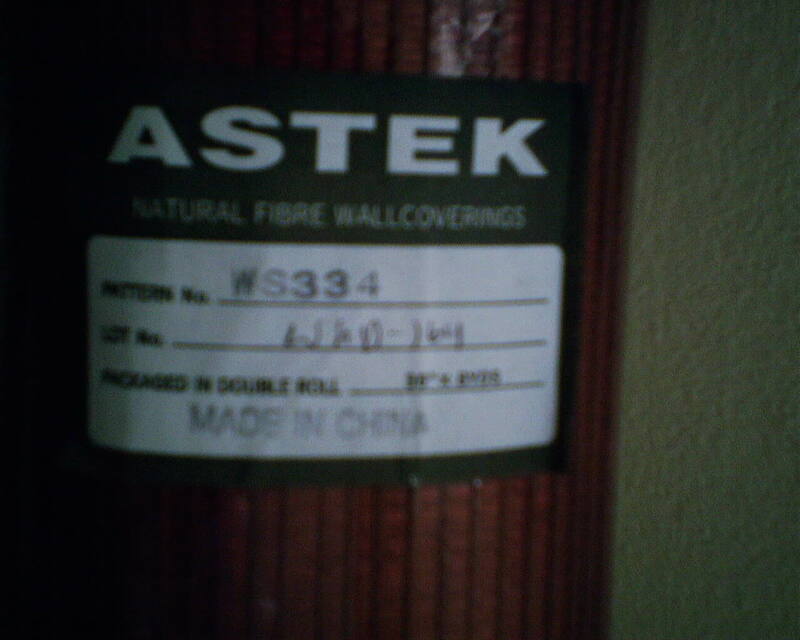 Incidentally, this was a paste-the-wall product, one of the new (and not necessarily good) innovations in “green” wallcoverings. Hanging a paper horizontally takes careful attention to plumb, and careful measuring and cutting, to ensure that those outside edges are absolutely straight and vertical. Pasting the wall is tricky in this job, too, because there was not a corner where the paper ended … I had to carefully estmate how far the paper would reach and therefor how far to spread paste on the wall. I kept the last 3/4″ or so unpasted, to avoid the chance of getting paste on the painted wall, and pasted last 3/4″ edge of the paper once it was all in place. I anticipated that smoothing might be different, because I was going horizontally instead of the typical verticle, but it went quite well. So, I’m at a birthday party last night, for the accountant gal who protests my home appraisal, Laura Mullen of Mullen Consulting http://mullenconsultingllc.com/. We were standing in a circle watching her open her presents, and it was made note that I had wrapped her gift in wallpaper. Than it was explained that I am a wallpaper hanger. I’ll surely blog about this over and over again. Just because a single roll of wallpaper has 28 square feet on it, it doesn’t mean you have all that paper available to be put on the wall. One reason you need to buy a little extra paper is because you generally have to throw away the first foot or so on the roll. To match the pattern, yes, but also because the manufacturer’s labels, tape, finger prints, smudges, and other marks can render the first foot or so too damaged to use. Wow…I didn’t realize they had this style back then. 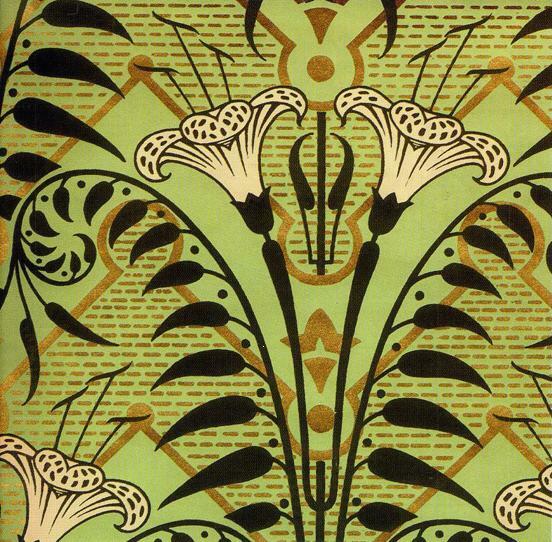 To me, this looks more Art Nouveau, or possibly Art Deco, several decades later. I guess it fits the Victorian category. A true beauty, either way! Some manufacturers include marks like this (which wipe off with water) to make it clear where the pattern match is. My National Guild of Professional Paperhanger buddies on Facebook and I kinda scoff at these marks, because, I mean, really – how hard is it to see how to match the pattern? Well, today I got my comeuppance, as they say. The pattern is large geometric shapes, and they are all the same. So I cut my 10 strips, all the same, and started to hang. The first two went up perfectly. But the third strip did not match the previous strip. What the heck?! I took a closer look, and it turns out the geometric shapes are NOT all the same. In actuality, there are large shapes and small shapes. I had cut one double roll with the large shapes at the top of the wall, when it should have been the small ones. Ouch! Luckily, there were two full length strips remaining on the last double roll. I still needed one more… I was able to use one of the mis-cut strips, which after I properly matched it, was then a bit too short. So I got a scrap from the strip that I had had to remove from the wall, and spliced in a 9″ tall piece at the bottom corner of the wall. Unnoticeable. 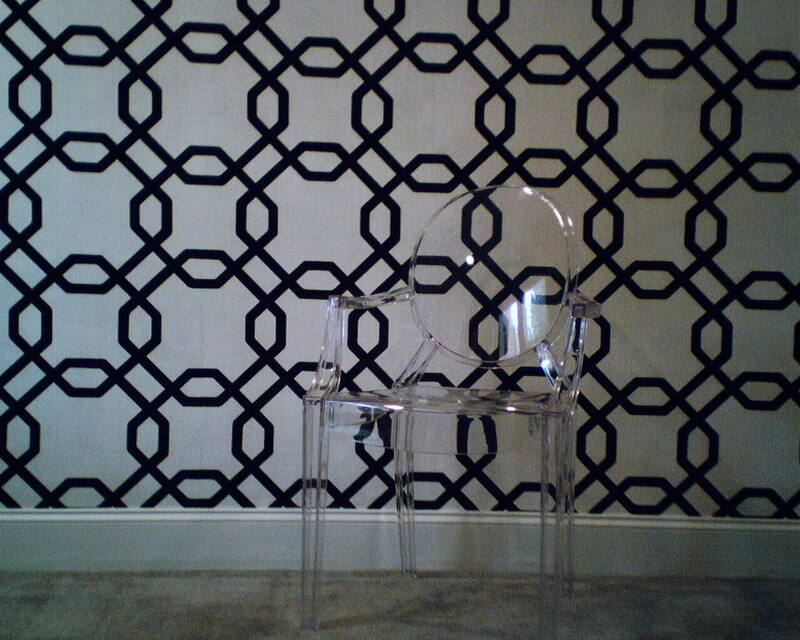 The paper is by Blonder, # GE58215, and is on an accent wall in the home office of a gal who designs women’s fashions. 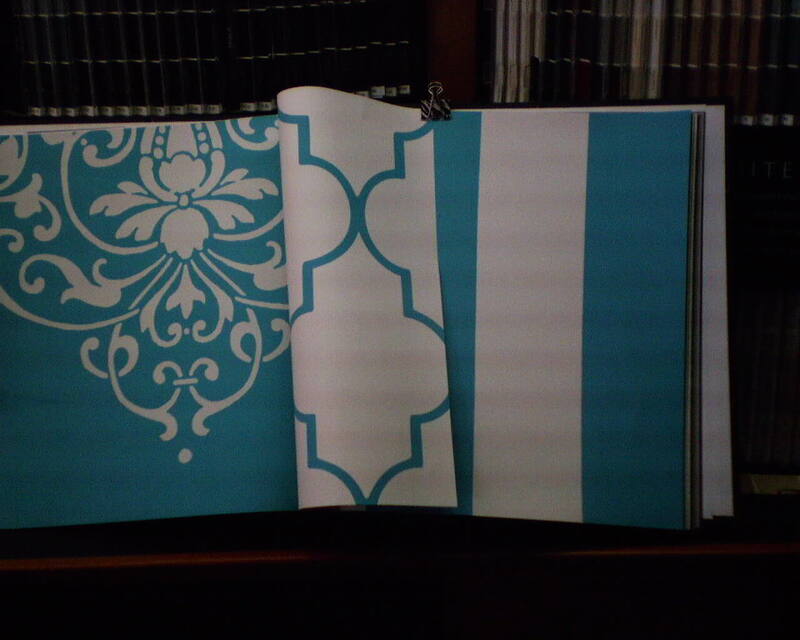 Most wallpaper books show actual samples of their papers, full size. There are usually several colorways of each pattern. In addition, there are often “companion papers” placed next to one another, showing papers that are designed to complement each other and might be used in combination – for instance, a paisley in the sink room of a bathroom and a coordinating stripe in the tub room. 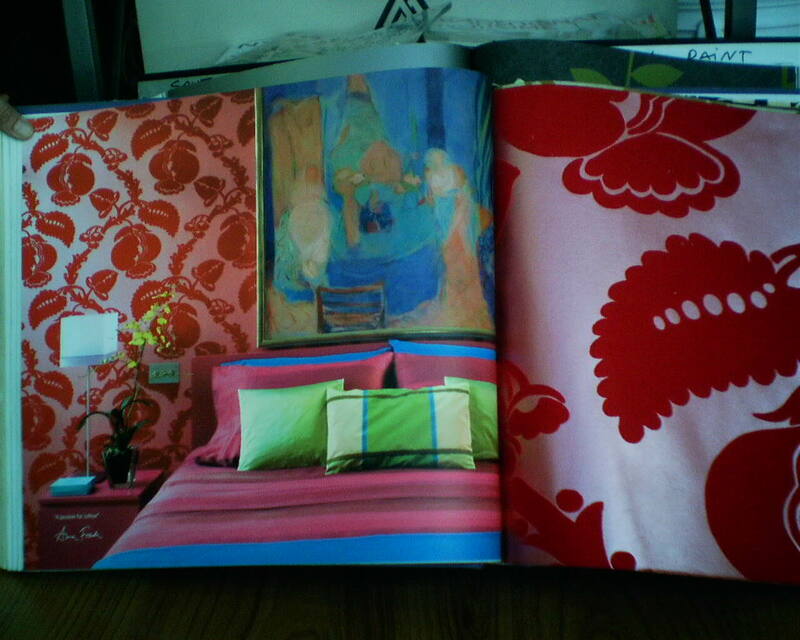 What’s most important, though, is the photographs manufacturers put in their books, showing the paper in an actual room setting, so you can see the full pattern (which may not be visible in the small sample in the book), its scale, and how it might look in your own home. I will be the first to say, I am not a fan of wallpaper anywhere other than on walls. But I have to admit, I think this turned out pretty darned well. 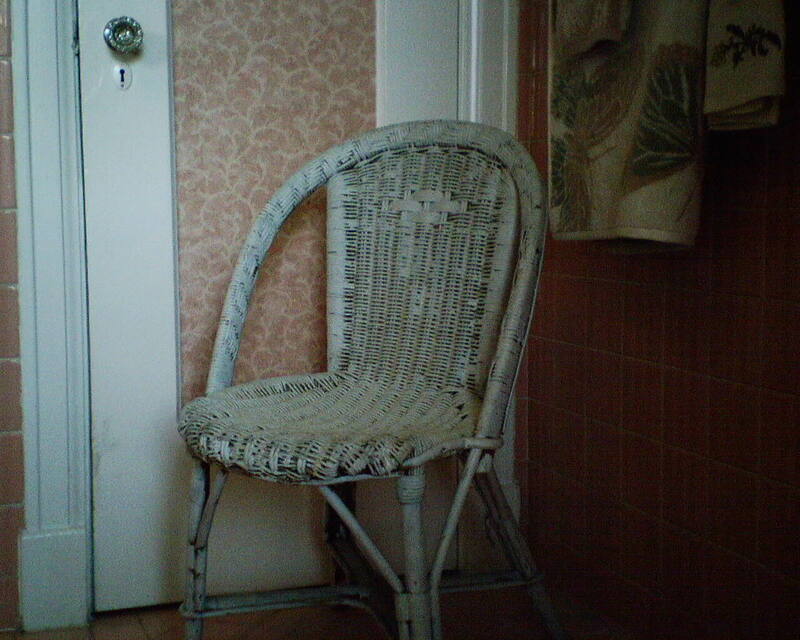 This was in the bathroom of a 1930 2-story house in the Rice Village area. I think the wallpaper plays off the original pink tile of this bathroom, and is a perfectly charming accent to the room. Not too long ago, I blogged about a paper that had water stains and mildew along one edge of every roll. I had to stop the installation and we had new paper sent. The replacement paper was stained, too, so we had more sent. This still had some very faint stains. But the clients are pretty eager to get their rooms finished and put back together, and to be honest, not everyone sees (or is bothered by) the little things that I see. So I decided to do a test hang, so they could see for themselves how the seams would look. Using a light-weight board, and working with four different pastes, I made samples of seams both with and without the stained edge. 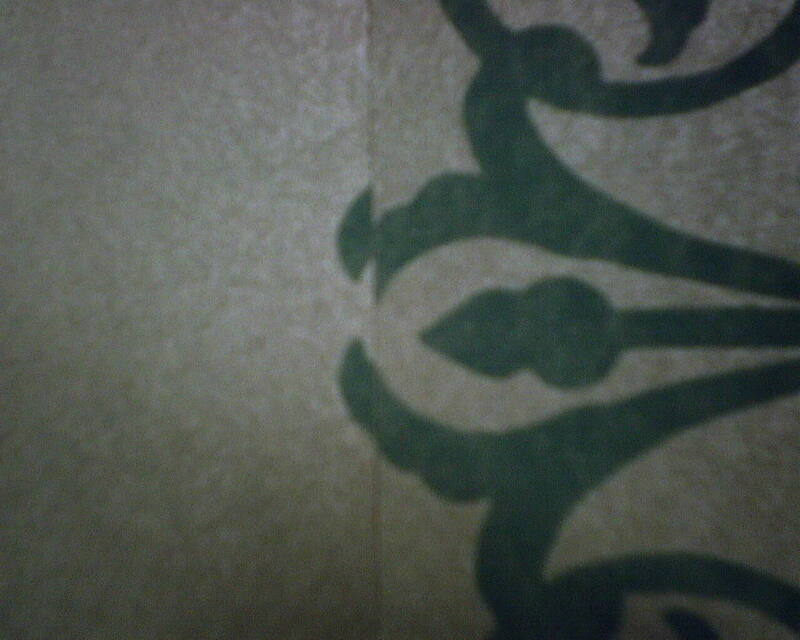 To my eye, the stained edge showed as a hair’s breadth brown line at intervals along the seam. It was tricky to see, because the paper itself is quite thick and somewhat spongy, which results in seams that are naturally more visible than on a thinner paper. Well, e-mailing photos back and forth and giving written descriptions didn’t convey well enough how the sample looked. It would be better to see it in person. Problem… this family is out in Tomball, and I’m in downtown Houston. That’s an hour’s drive, minimum. I didn’t have any jobs set for anywhere out near them, and the installation is set for 2 weeks from now, so they needed to see the samples soon. It turns out that the wife gets her hair cut at the little salon on my street, just four blocks away! Some grasscloths that have ink sprayed on the surface are very unstable… If the manufacturers would only apply a sealant, they would perform much better. Or, better yet, are the goods made with the color coming from the colored paper backing, with natural colored ‘grass’ on the surface, and no dyes sprayed on at all. The problem is that with the sprayed-on goods, the color can come off, leaving blotches on the surface of the paper. This paper bled so badly that red ink got all over the woodwork, or anywhere where even the slightest bit of dampness touched the paper. 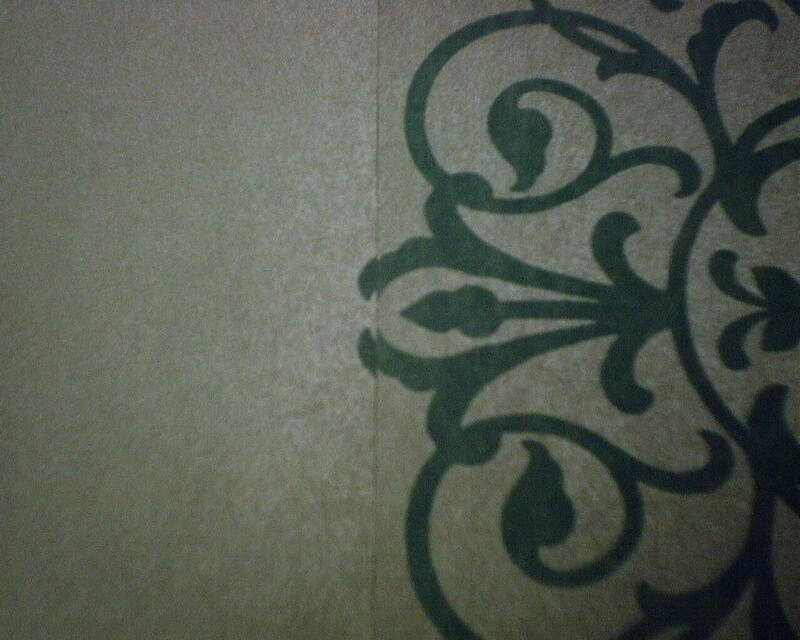 These papers can also stain quite easily, even with clear paste made especially for grasscloth. People buy these papers because they look beautiful in the selection books, having no idea how BAD they can end up looking on their wall. This homeowner said she had doubts when she first looked at the wrapped roll, with ink smudges plainly visible on the label…even the person who wrapped the paper got ink smeared on his hands and everything he touched. Ironically, earlier in the week, I had installed another Astek grasscloth (natural color) and it performed beautifully. This photo shows the ink that came off on my DRY hands, just in unwrapping the paper, and one very red spot on my rag when I touched the paper lightly to test it. 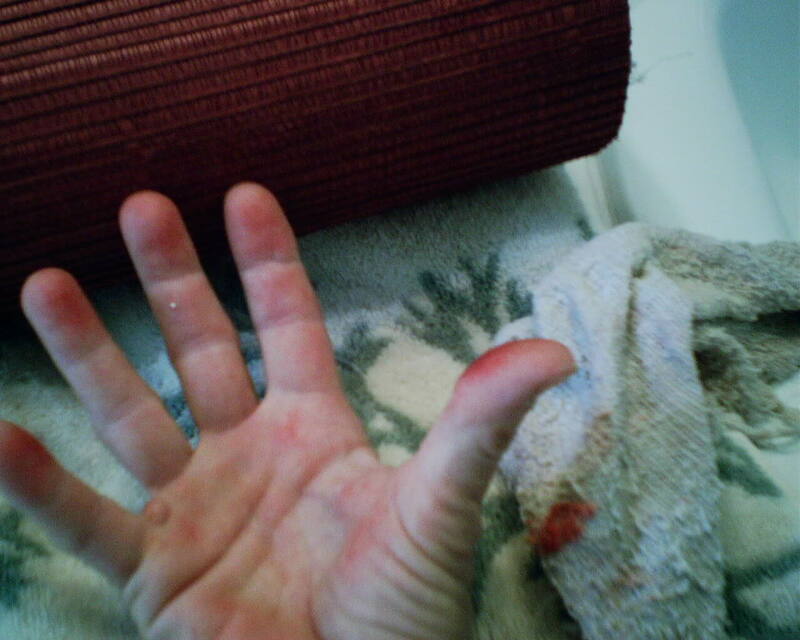 I avoided getting water or paste on the paper, yet by the time I finished with each individual strip, my hands were absolutely crimson, and felt thick with ink. Working with this Brewster pattern today, I got the powder room all smoothed and primed, dragged in my work table and 50lb bucket of paste (2nd floor), plotted my pattern, then began to roll out the paper. Part of the plotting is checking the pattern match, to see what element I want to put at the top of the wall. Dang! 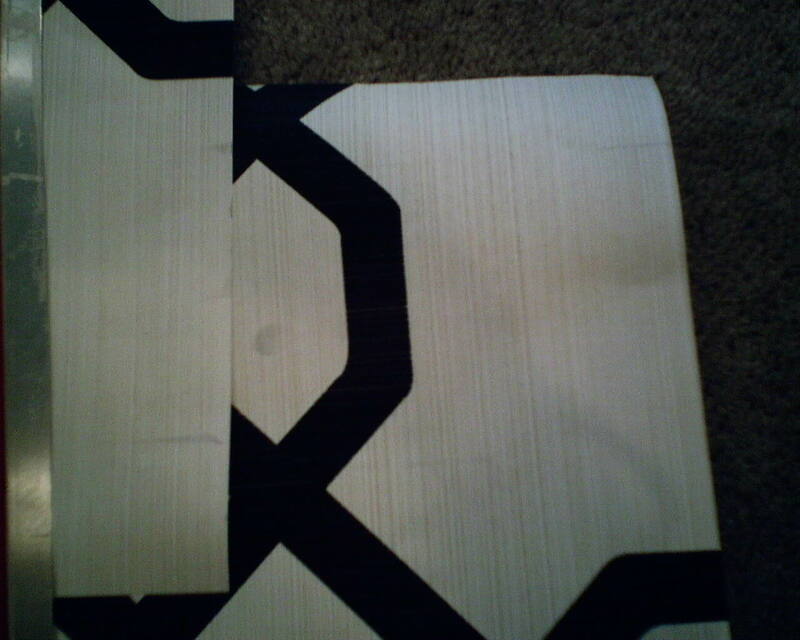 The pattern had been miscut, with too much of the pattern on the left edge of the paper. 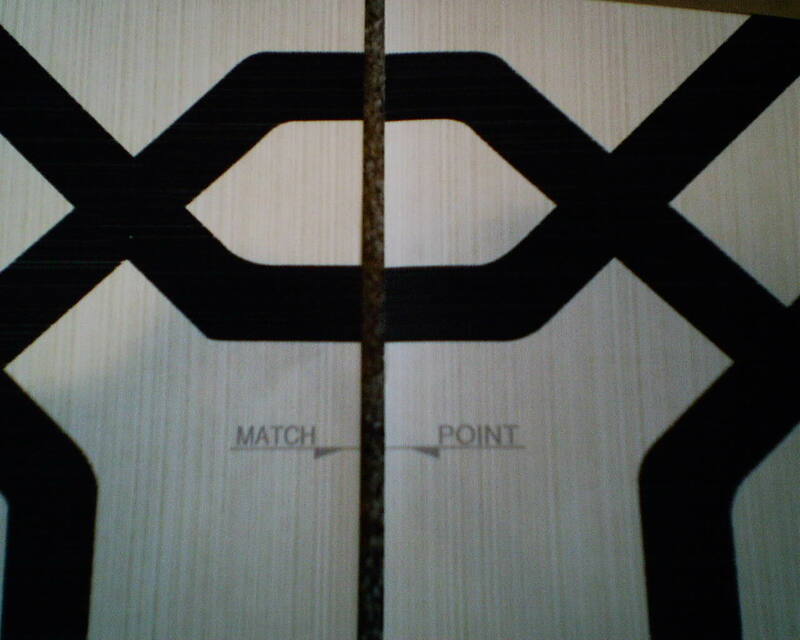 This meant that, at the spot where the pattern matched to the adjacent strip, part of the pattern repeated itself. If this had been a busy, swirly pattern, you may not have noticed this. But, with such a sharp, distinct, humongous medallion as the sole element in the design, the defect was very noticeable. I didn’t like it, and called the homeowners in for a final decision. They didn’t like, either. So back to the store it goes. Hopefully the company will send a new run that is printed / cut perfectly. As the homeowners pointed out, if they had printed the design so it ran down the center of the strip, and did not have to be matched to the next strip, this would not be an issue. I also want to make the point that these people bought paper from the Southwestern Paint on Bissonnet near Kirby, and have the sales gal there, Dorota, to contact the vendor and help them with this problem. When purchases are made via the Internet, customers are often left hanging, with no one who “knows the ropes” – or cares – to take care of the issue. You are currently browsing the Wallpaperlady's Blog blog archives for July, 2012.